‘Theatre Crafts & Design’ (studies in both Fine Arts and Theatre Design). 2005- 2010 Numerous Cultural Arts Sector Workshops. 1978 – 2016 Body of work in Iconography: British Columbia, Alberta, Manitoba, and USA. 2006 – 2013 Freelancing Artist and Arts Administration in Winnipeg and Vancouver. Three pieces accepted into the show. Two pieces accepted into the show. 24”x36” Acrylic on exhibition canvas. The Body of Work within Byzantine Iconography in archival acrylic and gold on wood, spanning from 1980 to 2016, with icons and murals, primarily throughout Western Canada. “Holy Family Icon” Centenary icon for the Archdiocese. permanently installed in the Cathedral on December 6, 2016. “St. Joseph the Worker Icon” Centenary icon for the Archdiocese. November 2014, then permanently installed in its Chapel in the Basilica. 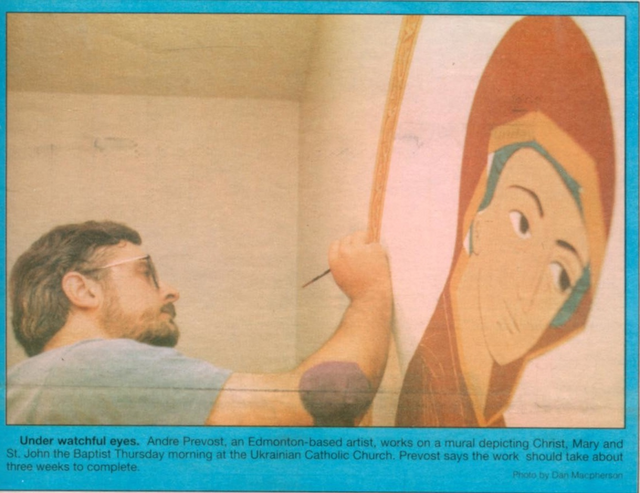 1989 Solo Exhibit - Providence Renewal Center, Edmonton AB Exhibit of 20 of my Icons. Orthodox Church, Vancouver BC featuring national Iconographers. Vancouver, and numerous other art pieces in ink pencil and oil. 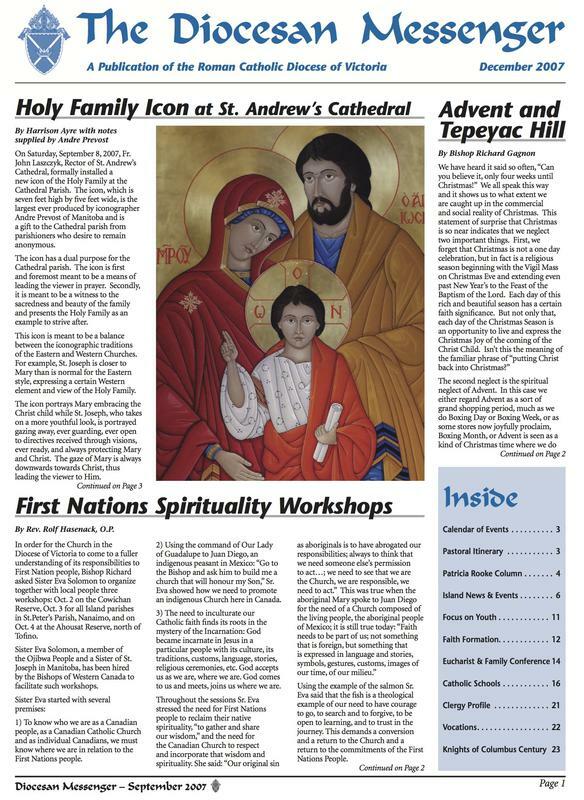 Illustration of Our Lady Of Canada icon was included in the book and back cover. 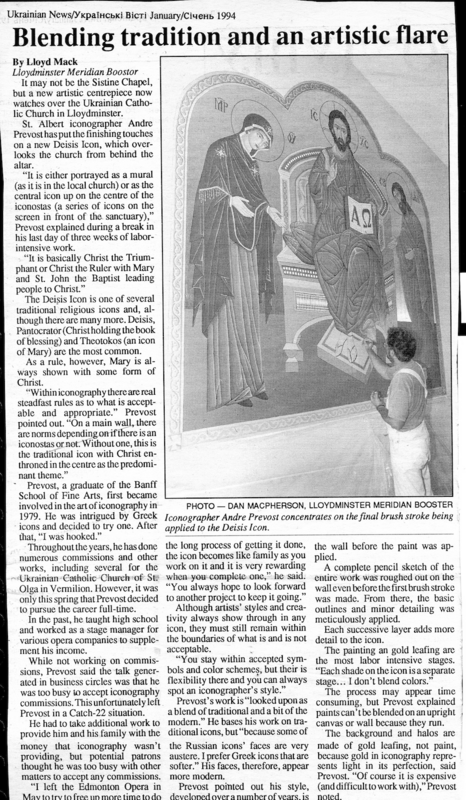 · BC Catholic 1988 Canadian Papal Visit edition: 1980 Theotokos icon used as centerfold. · Liturgical Calendar 1987/88 (published by CCCB): full colour print of 1980 Theotokos icon. 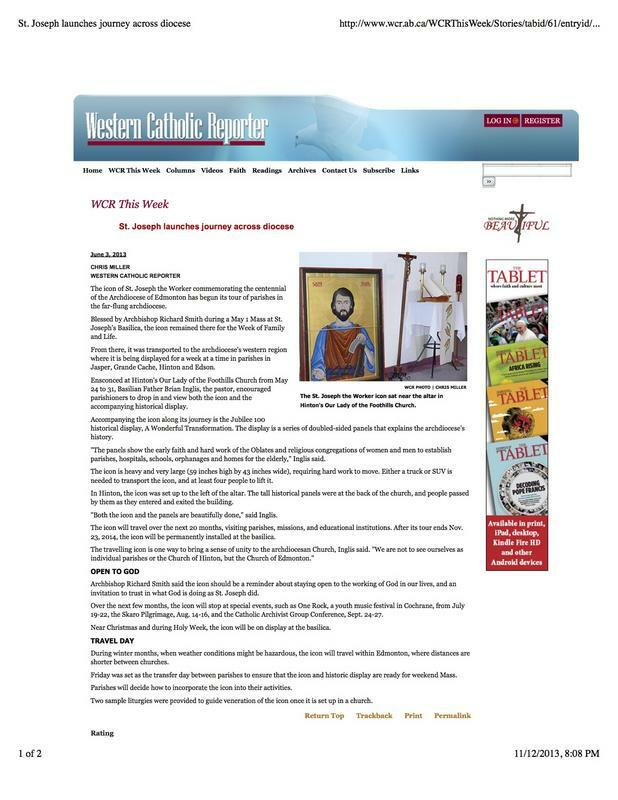 · The BC Catholic and Western Catholic Reporter did articles on the Centenary icon of St.
Joseph the Worker in Edmonton AB and the Holy Family icon in Victoria BC. Repaired and re-gilded Sanctuary Icons in 23K gold. Thomas Merton, St. Macarius the Great. - “Our Lady of Canada Icon”, All Saints Orthodox Cathedral, Edmonton AB 19' x 24"
Designed the Iconostas and wrote all 22 icons within it.